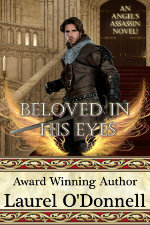 For this week’s Medieval Romance Monday, we are featuring the brand new medieval romance novel Beloved in His Eyes by Laurel O’Donnell! This is the third book in the Angel’s Assassin series. This entry was posted in Blogs, Medieval Romance Monday and tagged laurel o'donnell, medieval romance monday. Bookmark the permalink.